Michelangelo created 3 of the worlds greatest masterpieces, when merely creating 1 is an awe inspiring feat on its own. Both videos of the two part series are included as a playlist in the video player. The Sistine Chapel – The ceiling paintings. Michelangelo di Lodovico Buonarroti Simoni lived for about 90 years from 1475 to 1564. His passion for God, art, and beauty were driving forces through Michelangelo’s life. 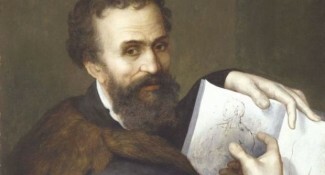 Michelangelo was considered one of the most influential artistic minds of his time, and is widely considered to be the greatest artist of all time. The Pietà and David, 2 of his best known sculptures, were finished before his 30th birthday. We have no idea why they call him divine. If ya dead you can’t be too divine.